Once you have your polished resume, take advantage of cloud storage to keep it safe. Use a company that will keep this most important document safe and easily accessible. This way, you can pull it up on your smartphone during interviews if the need arises. In today’s social climate, networking is actually a more valuable work-search skill than other approaches. Post your resume on all the best job sites. There are hundreds of these sites that exist in cyber space. Use them to help you land that dream job. Update your social networks, such as Linked In. These networks allow others to endorse and recommend you on your strengths. Encourage previous employers, college professors and coworkers to log in on Linked In and write a short blurb about everything you do right. Word of mouth is another superior networking tool. Make sure your family, friends, and friends of friends know that you’re in the job market and what kind of job you’re looking for. You never know when you’ll get a call out of the blue from your cousin telling you about that perfect job opportunity that hasn’t yet been advertised. Being the first to get your foot in the door can make all the difference. Log into all your favorite job search sites, and sign up to receive email alerts when jobs matching ones you’re interested in become available. This will give you a leg up on your competition. Most sites will send you daily, weekly or instant alerts when jobs become available, but setting your preferences to “instant” is the smartest way to go. Sync your email alerts to your smartphone so you get those notices on the go. Print up a business card with your name, contact information and a QR code that points to your online resume, as 1st Writer suggests. Send them out to prospective businesses — the companies you’re dying to work for — and hopefully, someone in charge will take the moment that is needed to scan your personalized code with their smartphone. 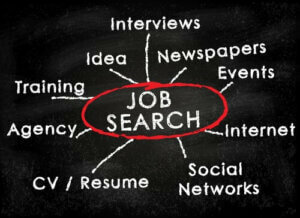 Have your cards with you when you attend job fairs and trade shows, and be generous in handing them out. Give a supply to friends and family to pass along to their bosses and coworkers. Getting the word out in a way that’s time saving for the person who’s researching you will give you the advantage over those who send traditional paper resumes and cover letters. A simple swipe of the phone could get you in the door and on your way to that eventual corner office. Viola just got promoted to a managerial position at her job. Her first initiative is to start a health and wellness competition for all the employees.